The Kia Sportage and Nissan X-Trail are two of the market’s most popular medium-sized SUVs, owning a neat 20 per cent market share between them. What’s interesting about comparing this pair is the different approaches the respective brands have taken. The Kia prioritises visual appeal and a hint of sportiness, whereas the Nissan is all about maximising practicality for a growing family. The Kia has impressed us more lately, but there are countless happy X-Trail owners whose loyalties have been built up over generations. Yours truly once owned a T31 X-Trail (previous generation, the longer boxy one). The two specs on test are the range-topping Sportage GT-Line and the X-Trail Ti. They also cost the same at the flagship spec levels tested, at $44,790 before on-road costs. And in both cases, we’d suggest you haggle hard at the dealer, because you’ll absolutely do better. Both come pretty well equipped for the money, as both of these are definitely mainstream, unpretentious brands. Main rivals at this price include the outstanding Honda CR-V VTi-LX, Hyundai Tucson Highlander and top-selling Mazda CX-5 GT. Safety equipment on both includes six airbags (front, and side for both rows), a forward collision alert system that warns you of an impending collision, autonomous emergency braking that stops you automatically if you ignore the warning, and lights in the mirrors that alert you if someone is hovering in your blind spot. There’s also rear cross-traffic alert that warns you of encroaching traffic when you’re backing out of a bay, active cruise control that matches the speed of the car ahead, and systems that let you know when you’ve left your lane. Both naturally have the highest ANCAP rating of five stars, the Kia’s scored in 2016 (not updated with the recent mid-life refresh) and the Nissan in 2017. Common features inside include digital radio, eight-speaker audio systems (JBL on the Kia, Bose on the Nissan), leather seats with heating for front occupants, button start, climate control, rear-row air vents, rain-sensing windscreen wipers, dusk-sensing headlights, LED headlights and tail-lights, panoramic sunroofs, 19-inch wheels, window tinting, and electric tailgates. Unique to the Nissan is a 360-degree camera with nifty overhead view, though it’s got very grainy resolution, and heated rear seats. But the Kia alone offers an 8.0-inch touchscreen (7.0 inches on the Nissan), Apple CarPlay/Android Auto connections, a Qi wireless phone charger, and ventilated front seats. It’s also got a full-size spare wheel, not a temporary space-saver one. So when it comes to equipment for the money, the Kia has the edge. It’s easy to spot Kia’s inspiration in the design of its interiors. There’s a bit of a European feel inside, and an instrument fascia tilted towards the driver. The big improvement on the MY18 model is the revised centre touchscreen, which sits flush and can be swiped like a phone. While the UX is familiar – a home screen made up of tiles, with maps on the left and audio/phone the right – it now supports Apple CarPlay and Android Auto smartphone mirroring, as well as DAB+, Bluetooth/USB playing and satellite navigation. Below this screen are simple ventilation controls and UI shortcut buttons, unfortunately ringed in gauche glossy black plastic. Below this is a large open area with a Qi wireless phone-charging pad. Nifty. There’s also a programmable shortcut button. There’s no native voice control, instead it hijacks your Siri or Google voice system when you’re paired. The steering wheel is wrapped in nice leather and has a GT-Line logo on the lower silver-coloured spoke, with radar cruise and audio/phone control buttons on the others. The basic driver instruments ring a screen that shows digital speed, fuel use, active safety adjustments, map instructions and more. The colour coordination inside our test car was… Interesting. Cream leather seats and cream plastic on the doors and transmission tunnel, offset by contrasting splashes of black on the side bolsters and atop the dash. You can get plain black if you prefer something more austere, and easy to keep clean. The seats themselves have heating and cooling up front, the latter of which is brilliant for summer, and notably soft headrests. Back-row occupants get acceptable leg room, even if they’re 193cm adults like me, and liveable head room despite that huge panoramic glass roof. The seats are mounted lower than the Nissan’s, and the side windows are slimmer. The back panels on the front seats are hard, easy-to-clean plastic, and there are three top-tether points and two ISOFIX ones. Amenities include coat hooks, LED reading lights, rear air vents, rear USB and 12V inputs and cupholders. The back seatbacks also recline. The Kia may be 20cm shorter than the Nissan, but its wheelbase is similar, ergo the rear space is deceptively good. Kia’s cargo space claim of 466L with five seats in use is 100L less than the Nissan’s, and while there’s room for a pram, or some luggage, it’s not the most spacious boot space in the segment. You get four tie-down points, two bag hooks and two positions for the parcel blind, and a nice brushed-metal-look kick plate. Under the floor is a full-size alloy spare wheel (big tick), though this removes the under-floor storage area for the detachable cargo blind. Still, the right decision from Kia there. Updates to the X-Trail have gone a long way to making the cabin more contemporary. For instance, that new steering wheel design is so much better than the old one. It’s also trimmed in leather and has damped buttons, and is even heated for cold winter mornings. There’s a large instrument display behind this with a digital speedo, which can also show things such as your 4×4 progress. To the left of this is the starter button, then the 7.0-inch centre touchscreen. Not Nissan’s strong suit, this lacks Apple/Android, and the navigation software is a little dated. The processing power could also be better, as could the camera clarity. The Japanese build quality is generally evident, though the door cards are a little flimsy. We like the supple softness of the black leather seats, and the padding on the doors, dash and console, which lends an upmarket feel. The centre console is smaller than the Kia’s, but still useable. Another low-light is the clunky foot-operated parking brake (compared to the Kia’s electric button, complemented by an Auto Hold that stops you creeping when in D), the single USB point and the comparative lack of cabin storage, offset in part by the fact that the cupholders are heated and cooled – an X-Trail staple. The Nissan’s back-seat occupants sit high up, meaning kids get great outward visibility, but taller occupants will find head room limited with that sunroof in place. As well as reclining, those back seats also slide forward and aft on rails, which adds an extra dimension. Top-tether and ISOFIX anchors are naturally fitted. Rear amenities include air vents, though there are no USB or 12V inputs. The middle-seat-portion back piece also flips down to allow long items to poke between the two outboard seats. Leg room and shoulder room are also fantastic, as is outward visibility – second in the class only to the glasshouse-like Subaru Forester. As well as its bigger boot space (offset in part by the lack of a full-size spare wheel), the Nissan’s party trick is a two-level loading floor that can be configured into a water-resistant tub, with a carpeted lid. Neat trick, that. It also has the slowest electric tailgate ever. 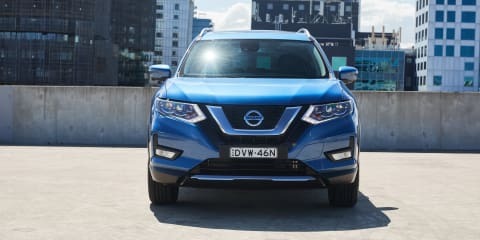 On an additional note, the X-Trail can be had in seven-seat form in lower-specification grade, with a third row that stows away and can be used for small kids. But all told, the Kia’s interior does more things well, we think. It’s got a little less boot space and rear occupants sit lower, but it’s still very practical and looks more contemporary, and comes laden with a more modern suite of tech. The engines on offer here are about as vanilla as it gets. The X-Trail has a 2.5-litre naturally aspirated petrol making peak power of 126kW at 6000rpm and maximum torque (pulling power) of 226Nm at 4400rpm. It’s matched to a belt-driven CVT automatic; a type of infinitely variable transmission with no fixed ratios that doesn’t need to ‘shift’ between them. The Kia has a 2.4-litre NA petrol engine making slightly peppier figures of 135kW (at 6000rpm) and 237Nm (at 4000rpm), matched to a conventional planetary six-speed automatic transmission with torque converter. The Kia is 80kg heavier, however. Both engines are what we’d define as ‘adequate’, happiest doddling around town on school or shopping trips, or sitting unfussed at highways speeds. They’re unobtrusive, and generally at their most refined here. Their combined-cycle fuel economy yields are almost identical in this sort of mixed driving, at 8.3L/100km for the Nissan and 8.5L/100km for the Kia. Because both make their peak outputs high up the rev band, they become louder and less refined under heavier applications of the accelerator. The Kia’s transmission gets more pep out of the engine off the mark, and keeps noise levels lower than the Nissan’s CVT, which elicits the familiar droning, changeless note that these otherwise clever and affordable ’boxes usually do. It’s worth noting that both of these cars come with 2.0-litre turbo-diesel engine options that are well worth a look if you do a lot of driving, travel regionally, or regularly carry five passengers/tow a trailer. Both cost about $3000 more, but will offer better resale value and superior performance, though with a little more clatter and less refinement at idle. The Nissan’s diesel makes 130kW/380Nm, and the Kia’s 136kW/400Nm (plus there’s a slick eight-speed auto), and in both cases these peak torque figures come in way earlier during the rev band, meaning effortless performance. Both also use about 25 per cent less fuel than the petrols, offsetting their higher servicing costs. The Kia’s engine has servicing intervals of 12 months or 15,000km, or whichever comes first, with the first five visits currently capped at $1972 all up (liable to scale up with CPI). The Nissan’s intervals are every 10,000km, with the first five visits capped at $1464. So, shorter intervals but cheaper costs. The reality is that the engines are unlikely to be the decision pressure points on either of these cars. We’d give the edge to the Kia, given its more responsive gearbox, higher outputs without a notable fuel-economy impost, and longer service intervals. 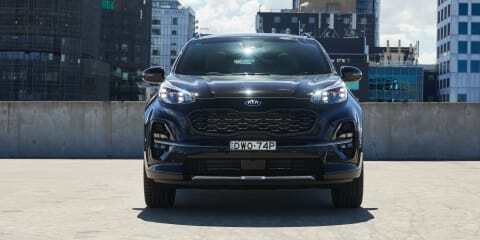 Both the Sportage GT-Line and X-Trail Ti here have all-wheel-drive (AWD) systems that work ‘on demand’, meaning they are front-wheel drive like a hatchback around town, but send torque to the rear axle on slippery surfaces like gravel, grass or snow. In both cases we found the rear hooked up pretty quickly, getting us out of a few moderately slippery situations. Both get a locking diff that maintains torque delivery at a fixed rate at both axles, and hill-descent control that electro-mechanically mimics low-range gearing for creeping down hills. The Kia gets both various drive modes that adjust the throttle mapping, and an Auto Hold function that stops your car ‘creeping’ in D when you lift off the brake in stop/start traffic. Both sport all-round independent suspension: MacPherson struts at the front and multi-link at the rear. Both are also slaves to style, rolling on 19-inch wheels with low aspect ratio (slim sidewall) tyres. The X-Trail’s general ride quality in lower grades is pretty good, but the slimmer tyres mean it feels a little unsettled and fidgety over pockmarked roads or cobbles, though there’s plenty of suspension travel and clearance to get over obstacles. The steering feel is light and vague, but let’s not waste time dissecting this too much. It feels stable and planted on the straight-ahead, but exhibits a little more lateral movement (roll) through corners. In terms of driving dynamics, the X-Trail is about as anonymous as it gets. Which is fine for a lot of people. Kia’s big point of difference is its Australia-specific suspension calibration. It sits flatter through corners and feels more nimble and agile, without letting any extra cabin noise intrude. But what really impresses us, and what’s more valuable for the segment, is its ride quality. Drive over cobbles, or corrugated gravel, or potholes, back to back in this pair, and it’s the Sportage that better insulates cabin occupants, taking the edge off sharp inputs. For small urban commutes the differences are negligible, but the Sportage’s quality comes to the fore the more you drive it. Bit of a difference here. At the time of writing, Nissan still offers a sub-par three-year/100,000km warranty, which you can extend for a fee. However, rumour has it that a five-year policy is on the table. As it should be. Nissan offers 24/7 roadside assist during the period. Kia Australia earned huge plaudits a few years ago for leapfrogging everyone with its market-leading (it still is) seven-year/unlimited-distance warranty, and roadside assist provided you keep servicing the Kia at a company dealership. It’s transferable to future owners, too. There’s a reason why the X-Trail has at times been the world’s most popular SUV. It looks good, has tons of space, is bulletproof and can be had for a ripping deal. If Nissan is offering its super-low finance plans, even more reason. It’s not a car you’ll regret owning, though really the lower-grade ST or ST-L are better options given its core attributes. The Kia inspires us more. Its interior design is more contemporary, its cabin space not far behind despite more manageable exterior dimensions, and its driving manners are superior. As is Kia’s warranty cover, which reassures you today and improves your resale value tomorrow. Give me $45K for a medium-sized SUV and it’s probably the one I’d buy.